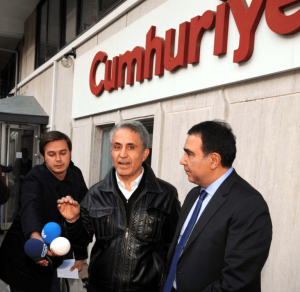 Five months after Turkish political cartoonist Musa Kart was arrested along with several of his colleagues from Cumhuriyet newspaper on suspicion of supporting Kurdish militants and the Gulenist movement, they finally were formally indicted this week. If convicted, Kart could face up to 29 years in prison. The charges specifically against Kart are “helping an armed terrorist organization while not being a member” and “abusing trust.” Organizations that advocate for press freedom, including the International Press Institute and the Committee to Protect Journalists, say that the charges are baseless and simply provide cover for President Recep Tayyip Erdoğan to silence accurate coverage of his regime. In total, Turkey is currently holding 141 journalists behind bars, most of them arrested in the months since the failed coup in July 2016. Turkey’s judicial system has not yet announced any trial dates for Kart and his colleagues, who have already been held without bail since November. We will be watching closely and provide updates as news develops!